We set the nursery up around the time I was 28 weeks pregnant, and since we intended for Charley to be allowed in the nursery (some parents don't), we started hanging out in there as a family sometimes, just so it wasn't a weird and foreign room to him during the inevitable long nights spent in there. Babies make a lot of noises, some of them tiny and adorable and some of them decidedly not. We were concerned that Charley would be upset by crying babies and it would stress him out, so once we had the cribs set up in the nursery, we started putting crying baby YouTube videos on our phones, putting the phones in the cribs, and either hanging out in the nursery with them or walking away. We wouldn't let it go on too long, but we'd increase the duration gradually so that he would get used to hearing these sounds for a while. This is very common advice on the Internet, and we decided to give it a go. Charley stayed with my inlaws while we were all in the hospital, and once the babies were born, we sent home blankets that they'd been wrapped in for Charley to cuddle and sniff so he would be at least somewhat familiar with their scents. We didn't really think he seemed to recognize them by scent when he met them, but who knows... it may have helped and couldn't have hurt. We knew at some point the kids would find Charley's soft fur and long ears irresistible... so while we were cuddling him, every once in a while, we'd give his hair or ear or tail a little tug. Not too much, and not as roughly as the babies do now, but we gradually tried to increase his tolerance to being picked on. It still breaks my heart a little that my sweet only baby of six years may have felt hurt by not getting all of my attention anymore. He and I are pretty much joined at the hip, and he used to be in my lap any time I was seated. Having a ginormous baby bump that occupied most of my lap helped dethrone him from that spot, and I encouraged him to snuggle up beside me instead. He got to be a big fan of the bump, and didin't even seem bothered when Sam would feel him on the other side and start kicking him. As I type this, my fur baby is laying against my right leg, fast asleep. That's his new spot and he seems totally satisfied. It was a much easier transition than I expected! 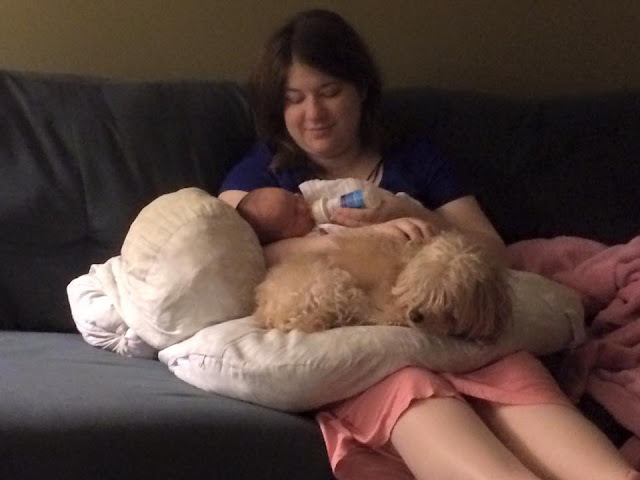 We left the hospital on Saturday afternoon, came home, got our stuff where it needed to go, and tried to settle in. But of course, a family member was missing since Charley was still with my inlaws. 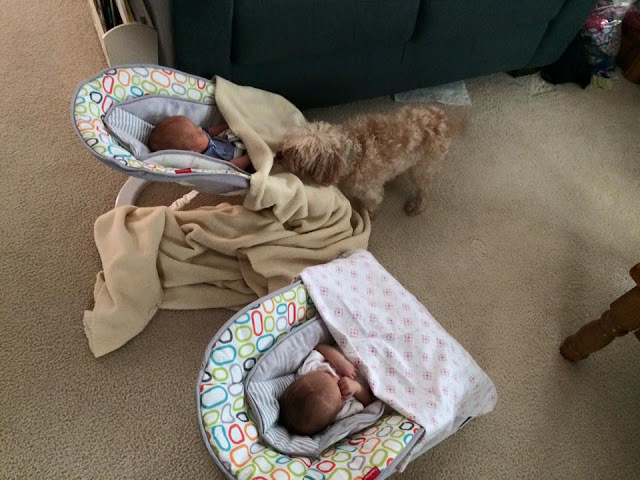 They came over for supper that night and to bring our "furstborn" home, so when they were on their way, we got the babies set up in their bouncy seats and cleared furniture and such from around them. We brought Charley in and let him greet us and get some of his characteristic spastic energy out on us, then we brought him over near the babies, ready to grab him if he got too excited. He walked right up to them, sniffed a whole bunch, then walked away. 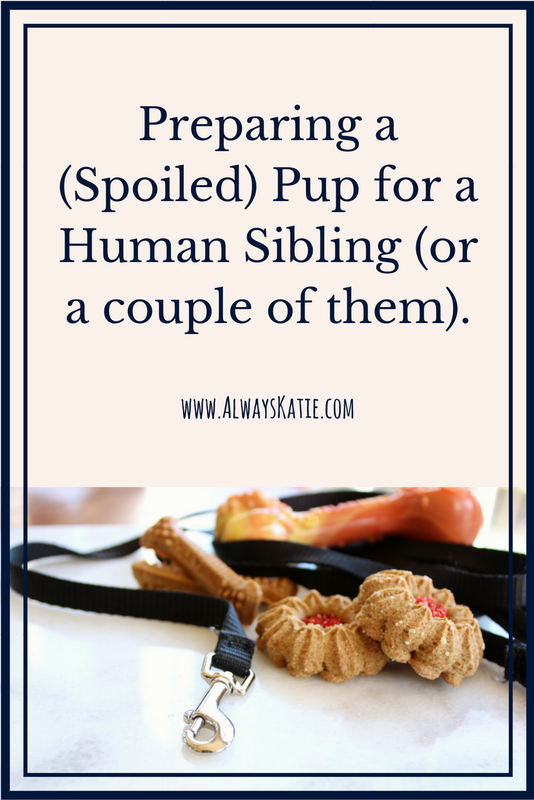 You know your dog better than anyone, so you know if you'll want to have your dog leashed when you introduce them, or have the baby in your arms, or maybe even in a pack-n-play so they can meet through mesh. Just try to have a plan, taking into account your dog's curiosity and energy level. Ours was frankly happier to see Ethan and me than he was curious about the new family members. Charley has heard the phrase, "good boy," SO many times since the babies came home! Any time he did anything that could remotely be construed as "good" - even if that was just the absence of being "bad" - he got praised endlessly those first few months. When he laid calmly next to me while I fed a baby, "gooood boy!" When he looked mournfully at me when a baby cried in the middle of the night and woke him up, quick ear rubs and "good boy!" When he licked a tiny toe as the toe's owner snoozed in a bouncy seat, "awww... such a sweet brother, good boy!" Praise, praise, praise. Your dog is going to need all the reassurance that you still love them and they haven't been "replaced." When you happen to have empty arms or a free hand, snuggle that pup or rub their ears or belly. They miss you! Babies are messy eaters, so it's a good idea to have a plan for handling meal time with your pup when you start feeding the baby/ies solid food. Because of Charley's past stomach problems, he's not allowed to have wheat, corn, or soy, so we shut him in the playroom during meal times, and make sure the floor is clean before we release him. I get a little jealous when other parents joke about their dog cleaning their floors, but that gastroenteritis was scary stuff, so we do what we've gotta do. :-) You may not need to do anything differently, but it's a good idea to consider it ahead of time. Do you need to work on table manners, begging, so the dog doesn't guilt the baby into sharing? All three of our babies are currently living in a pretty peaceful coexistence, and I think a lot of that has to do with the hard work we did before and after the babies were born. (Of course, some of it is because we have the best dog and sweetest babies ever.) It's a little tricky, and a little nerve-wracking to know you're shaking up your beloved pup's whole world, but with a little planning and conscientiousness and a lot of love, it's totally possible to do it in a gentle way that ends in the fur kids and human kids being the best of friends! 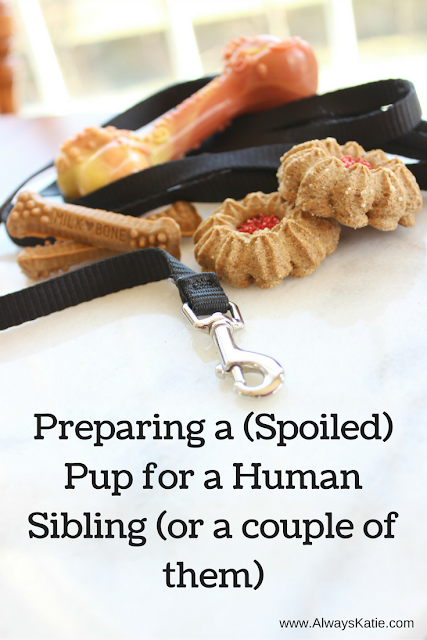 Parents out there, how else have you prepared your fur kids for the new humans in their pack?